Back in June, we had a great time at the Blade Show, as usual. If you missed the show this year, we hope to see you in 2017 - we will be there with new products! The latest news from Switzerland is that the current tough economic conditions forced Victorinox management to stop pursuing development and production of the best possible SAK and to limit themselves to basic models and colors. As a result, none of the Swiss Bianco special models and colors will be produced any longer. There is a short window of opportunity for collectors to purchase the pieces we still have in stock, as once they are gone, that's it! In the recent runs from Victorinox we observed higher than usual rate of quality issues, such as anodizing damage, so it seems that the economic issues also had impact on the level of quality control. We are thankful to Mr. Elsener and Victorinox for the past co-operation with us and hoping that this iconic company will be able to weather the storm. We are continuing our design and prototyping work on the quest to create the best Swiss knife there is. As a fortunate side effect of testing our design-to-manufacturing process, we developed scales for the 91mm Victorinox line of SAKs in a range of premium materials. 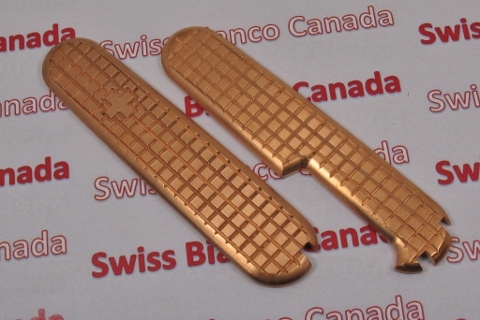 The first product we have available for sale are 91mm scales in 100% copper with CNC-machined waffle pattern. As we work on the new Swiss Bianco product line, more products will be released and we are already looking for qualified dealers worldwide. Thank you all for you continued support of Swiss Bianco! These solid copper scales in "Plus" style (with cut-outs for toothpick, tweezers, pen, and pin) are designed by Swiss Bianco. The weight of the scales is 67gm. The copper was left in natural finish to allow for the natural aging and patina process. These scales will fit any modern 91mm Victorinox SAK. Please see the Copper Scales Youtube video for a closer look at this premium accessory. You can follow the breaking news on Swissbianco projects through Swissbianco Facebook Page . For discussion of Swissbianco projects, please check out our forums: Swissbianco on BladeForums.com , Swissbianco on KnifeForums.com , Swissbianco on Messerforum.net (in German) , and Swissbianco on Knives.pl (in Polish) . You can find the latest Swissbianco photos in Swissbianco Photobucket . For general enquiries about Swiss Bianco and for US orders, please click here. For non-US orders, please click here. You ask me first if the limited goods are still available. You confirm with me the shipping price for your order. All prices in the newsletter do not include shipping, unless noted otherwise. We accept payments through our PayPal accounts: paypal@swissbianco.com for US orders and paypal@swissbianco.ca for Canadian/International orders. The list of goods you are ordering. To subscribe to (or unsubscribe from) the Swissbianco Newsletter, please click here.